TORONTO – Animal Justice Canada (“Animal Justice”) has submitted to the Ontario Ministry of Natural Resources and Forestry (“MNRF”) that moose calf hunting should cease entirely in the province of Ontario to respond to the crisis of the moose population decline. Recent population surveys have shown strict declines in moose populations in many parts of northern Ontario, a trend also being seen in other North American jurisdictions. In response, the MNRF has proposed decreasing the open hunting season for moose calves in parts of northern Ontario down from up to 12 weeks, down to two weeks. Animal Justice’s position is in line with the MNRF’s objectives, as stated in its Moose Management Policy, which include managing moose populations sustainably. Animal Justice recommends that, given the steady decline of the moose population in the last 15 years, it is appropriate to discontinue the calf moose hunt until moose numbers have stabilized. Shortening and delaying the hunting season, the two tactics the MNRF offers as a remedy, has not worked in the past to revive the moose population. 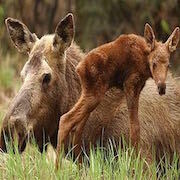 Rather, ceasing moose calf hunting entirely would better allow infant moose to live long enough to contribute to Ontario’s ecosystems and help moose populations rebound. Moose face pressure from predators, parasites, changes in climate and their habitat, as well as hunting. The former pressures are natural, or not immediately controllable, whereas population pressure from hunting is immediately controllable. The MNRF has asked Ontarians to participate in the planning and decision-making in moose management by providing feedback on the proposals. The public can find out more and submit comments here: http://apps.mnr.gov.on.ca/apps/dashboard/ontarios-moose-project. Animal Justice Canada is a charity dedicated to advancing public knowledge of animal practices and preventing the abuse and killing of animals through the enforcement of existing laws. Visit www.animaljustice.ca to learn more.